Both the male and female peregrine falcon have spent a great deal of time in and around the nest box over the past few days. The female has been spending nights in the nest box and has frequently been seen lying in the nest box. The adults formed the scrape,a shallow depression that the eggs are laid in. All of these behaviors indicated that eggs might be laid soon. This year the falcons have made their scrape very close to the front of the nest box resulting in a partially obstructed view. Both the male and female at times appeared to peering at an object in the scrape. Furthermore, both have spent time laying in the scrape as might be expected to keep an egg from being chilled. While the behavior of the birds indicated an egg might be present, we weren’t able to confirm it until early this afternoon. 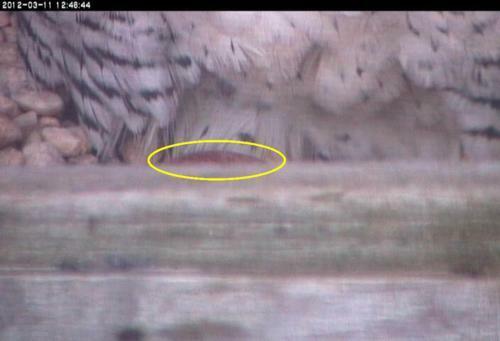 In the photo below the edge of the egg is just visible over the rim of the nest box. We’ll continue to watch for more eggs over the coming days.